Once every month on the blog this year, we’ll be doing a ‘walk of the month’ feature, which will shine a spotlight on a different walking route in West Dorset or East Devon. 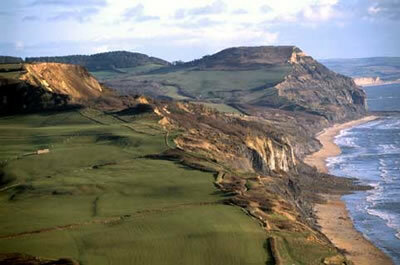 For this first edition, we’re focusing on Golden Cap, one of the most recognisable landmarks on the Jurassic Coast. Golden Cap is the highest sea cliff in the South of England, at a height of 191 metres – 30 metres taller than Beachy Head in Sussex. Don’t be put off by its daunting size though – the summit of the cliff is easily reached by following the gently sloping pathway that leads up to it. Our walk begins in picturesque Seatown, a lovely seaside village 5 miles from Newlands holiday park. A car park is located just behind the seafront, which means you an opportunity to take in the pretty pebble beach and surrounding cliffs when you park up. 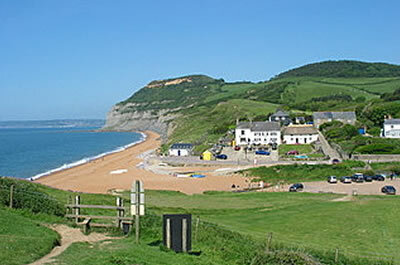 From the beach, we recommend you take the South West Coast Path and follow it west in the direction of Golden Cap. As the path steadily climbs, you will be treated to outstanding views of the Dorset coastline running down towards Portland. The path gets progressively steeper the nearer you get to the top, so if you’re not a seasoned hiker it’s a good idea to stop and take a breather if you need to, while taking in the fabulous scenery all around you. 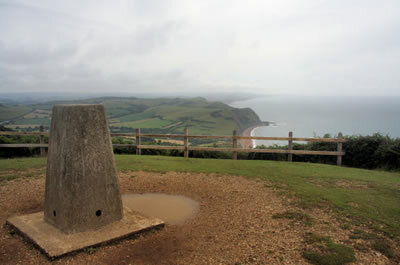 You’ll have no trouble finding your way to the summit of Golden Cap, and once there you’ll want to take in the views from both sides, with the distant Isle of Portland to the east, and Lyme Regis and beyond to the west. When you decide to move on, continue walking west in the direction of Charmouth, picking up the South West Coast Path again and descending from the summit past the Earl of Antrim memorial. Once you have come some way down the hill, you will come to a junction in the path, at which point you go right, bringing you past St. Gabriel’s, a lovely little ruined church nestled against trees and shrubs. Continuing on past the church, you will come to a lane, which you can follow until you reach a T junction. Take a right onto Muddyford Lane, and then follow the access road to Filcombe Farm. With Filcombe Wood on your right, carry on through the farm until you reach a gate at a fork in the road. The left fork will take you to Pettycrate Lane, which leads you on a gentle descent back down to Seatown. Turn right when you come to the main lane that runs through the village, and you will come to the car park where you began your journey. 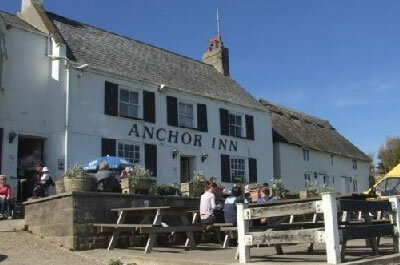 If you’re not ready to leave just yet, Seatown has a great little pub called The Anchor Inn, where you can rest your legs after all that walking and enjoy a bite to eat or a nice refreshing pint!